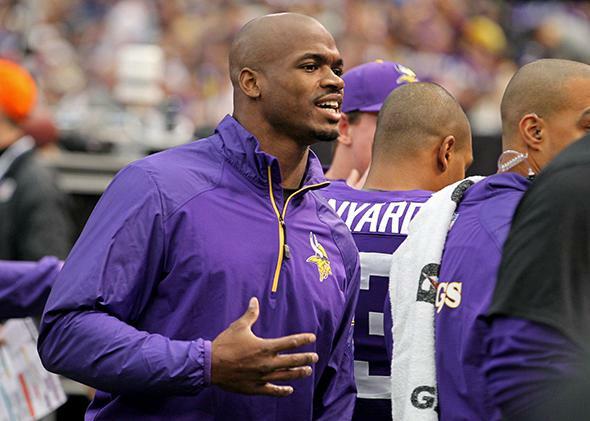 Adrian Peterson released following indictment for using branch to spank son. Minnesota Vikings running back Adrian Peterson on the sidelines during the first quarter against the Philadelphia Eagles, Minnesota, MN, Dec 15, 2013. Minnesota Vikings running back Adrian Peterson was released on a $15,000 bond early Saturday morning less than half an hour after he turned himself in to authorities in Montgomery, Texas. Peterson had been briefly detained after he was indicted by a grand jury that accuses him of reckless or negligent injury of a child due to his alleged use of what he called a “switch”—a tree branch stripped of its leaves and twigs—to spank his four-year-old son, reports ESPN. A doctor reported the child’s injuries to police, according to the Minneapolis Star Tribune. Peterson, who is the face of the Vikings, has been cooperating with authorities and did not mean any harm, according to a statement issued by his lawyer, who says the star player just did what his parents did to him. Shortly after Peterson was released, the Vikings issued a statement saying that Peterson, whose face is on the tickets for Sunday’s game, would be dropped from the roster for the Sunday matchup against the New England Patriots. The team said it is gathering information. Peterson’s indictment comes two weeks into the NFL season at a time when there is a lot of controversy swirling around professional football over how the organization handled a domestic abuse case involving Ray Rice. NFL Commissioner Roger Goodell recently increased penalties for domestic violence cases in which first time offenders automatically receive a six-game suspension, notes the New York Times. In a memo sent to all 32 teams, Goodell warned there would be severe penalties “if there are aggravating circumstances such as the presence or use of a weapon, choking, repeated striking, or when the act is committed against a pregnant woman or in the presence of a child,” reports the Associated Press. In a case of incredibly bad timing, Peterson is the star of the NFL Rush Zone cartoon this week.